Internal Height of all Opening Sizes: 89"/226cm, after the Arch has been pushed 12"/31cm into the ground. The width of the decorative scroll work is 6" so that the External Height is 95"/241cm. The depth, ie front to back measurement, of all Opening Sizes is 12" or 31cm. 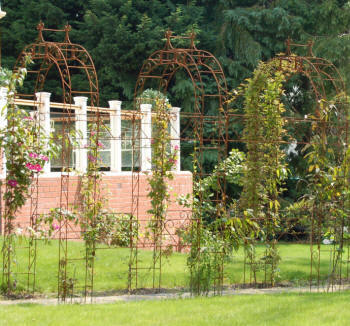 Click here for Pavilion Garden Arch prices. 4 ft/122cm and 5 ft/152cm opening sizes are more popular for this purpose than the 3 ft/91cm.The joined up arches forming the tunnel can feature pointed tops if required.For details of these and other Tunnels or Walkways click here to see Arbours, Gazebos and Tunnels. There are 7 Arches altogether in the Tunnel! Click on image to enlarge this pic and the pics below. 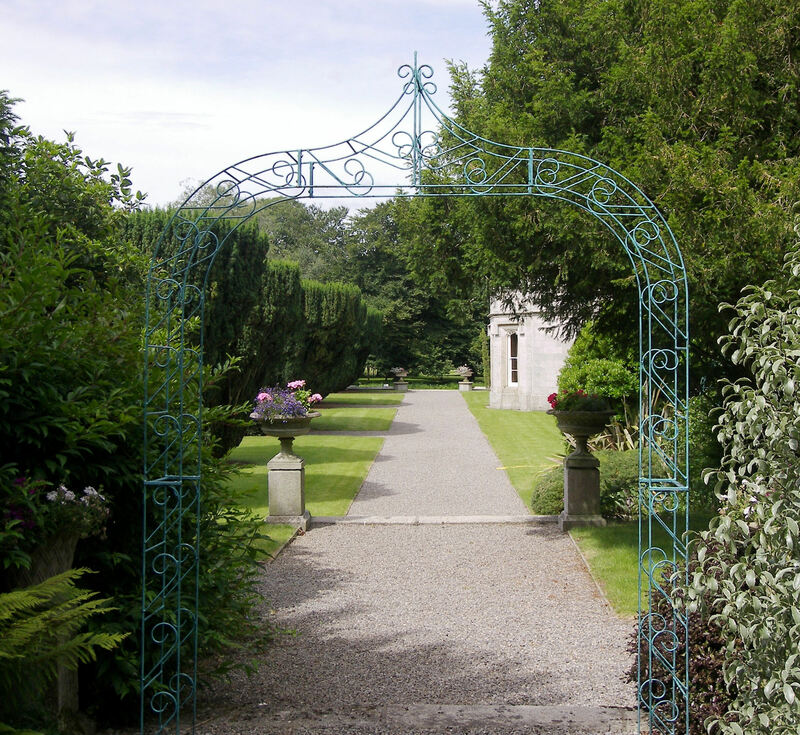 Shown below is a 6ft/183cm Opening Pavilion Arch with a Pointed Top finished in Hand Painted Verdigris on a Galvanised Undercoat. 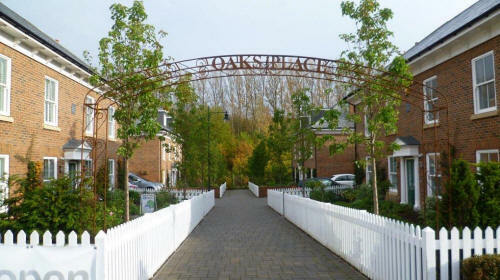 This size of Pavilion Arch is produced as a "special". 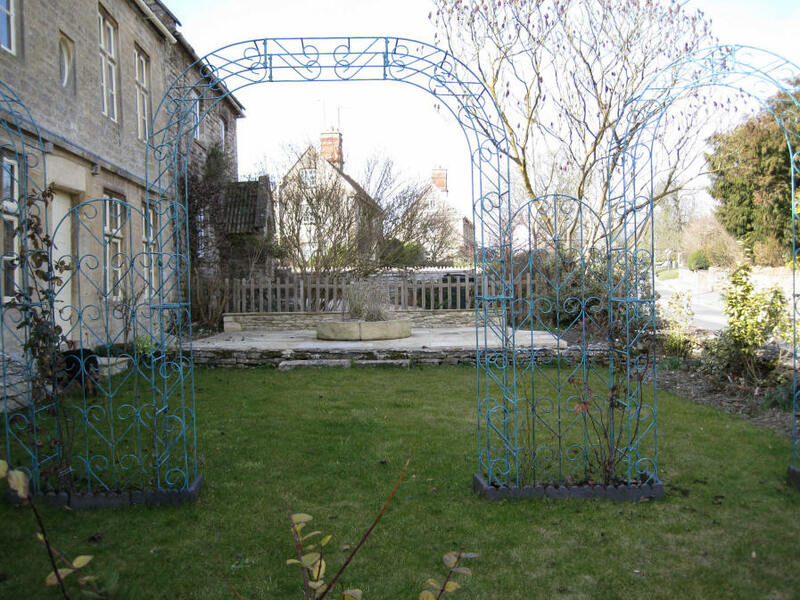 Shown above is a 5ft Opening Pavilion Arch in Hand Painted Verdigris with a decorative Panel, also in Verdigris on each side. Kent. The finish is natural Rusted. The top piece is designed to be easy to lift off to allow removal vans and the like to enter the site. 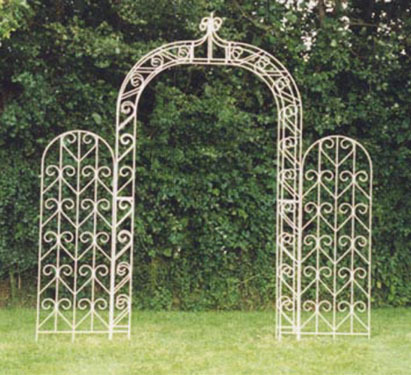 The 4ft and the 5ft opening Arches can be supplied with decorative pointed tops to the arches. Illustrated below is the 4 ft Opening Pavilion Arch with Pointed Top in white.. In this picture Decorative Panels are shown on each side of the Arch. For details of these please click here. To order: Phone us with your Credit or Debit Card details or post us a cheque (made out to Wessex Forge) for the full amount to us at Wessex Forge. You can also transfer the payment direct to our bank account if you prefer. Please aks us for details. We can arrange delivery to addresses throughout the world.